Volatile organic compounds (VOC) are a large group of compounds that are contained in common household products used to maintain and build our homes such as paint and cleaning products. When using these household products, the chemicals contained may be released into the indoor air we breathe. Some VOCs, namely benzene and toluene, are known to be toxic at very high concentrations. Exposure to VOCs at high levels could result in potential health effects such as dizziness or headaches, or more serious effects such as an altered immune response, certain types of cancers or neurological problems. While exposure to high concentrations of VOCs has been associated with health risks, a person's exposure to VOCs does not necessarily mean that it will affect their health. Factors such as the amount a person is exposed, the duration and timing of exposure, and the toxicity of the VOC are all important factors to consider when determining whether adverse health effects may occur in Canadian households. The Canadian Health Measures Survey (CHMS) measures the residential air concentration of 88 VOCs, including the group of VOCs known as BTEX (benzene, toluene, ethylbenzene, m- & p-xylene and o-xylene), in a representative sample of Canadian households with respondents ranging from 3 to 79 years old. Overall, the results show that generally Canadian households are not at risk of the presence of these compounds in their households, and on average, the indoor air concentrations are below Health Canada's guidelines. Results from the fourth cycle of the CHMS (2014 and 2015) show that the national average for indoor air concentration for toluene in Canadian households was 6.5 μg/m3. This was well below the Health Canada guideline for indoor air concentrations for a chronic exposure limit of 2,300 μg/m3 for toluene. The average indoor air concentrations of the other BTEX compounds were 1.1 μg/m3 for benzene, 3.3 μg/m3 for m- & p-xylene, 1.1 μg/m3 for o-xylene, and 0.99 μg/m3 for ethylbenzene. No Canadian indoor air guidelines are available for benzene, ethylbenzene or xylenes, but it is recommended that levels be as low as possible. 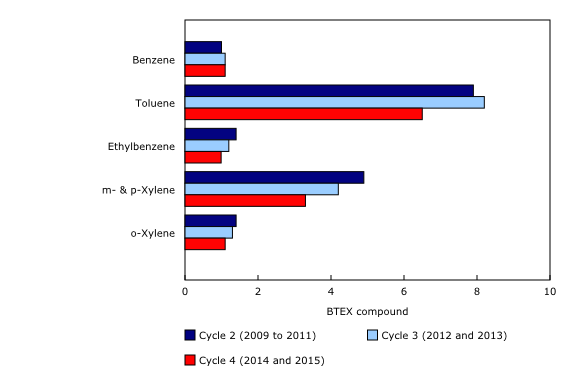 The average benzene, o-xylene and toluene concentrations in the indoor air of Canadian households were similar between Cycle 2 (2009 to 2011) and Cycle 4 (2014 and 2015) of the CHMS. However, the average ethylbenzene concentration in the indoor air of Canadian households decreased from 1.4 μg/m3 in Cycle 2 to 0.99 μg/m3 in Cycle 4. At the same time, there was a decrease in average m- & p-xylene concentration from 4.9 μg/m3 for Cycle 2 to 3.3 μg/m3 in Cycle 4. Certain sources in the household may increase the indoor air levels of BTEX compounds including different garage configurations and smoking habits at home. 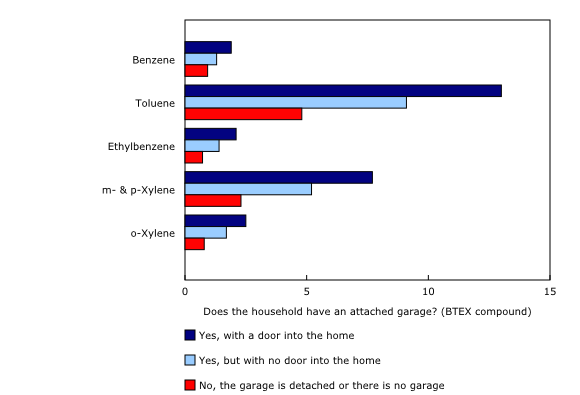 For example, results from Cycle 4 show the highest concentration of benzene was associated with dwellings with an attached garage that had a direct entry into the home (1.9 μg/m3) compared with dwellings that did not (1.3 μg/m3) or dwellings that had no garage at all (0.93 μg/m3). This was a similar trend for other BTEX compounds but differences in concentrations were only found between dwellings with an attached garage with a direct entry into the home and dwellings that had no garage at all. 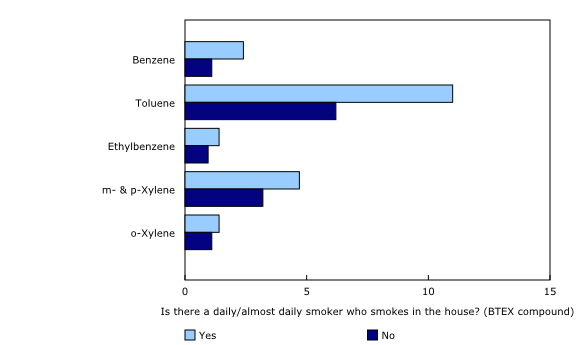 Concentrations of BTEX compounds were also significantly higher in households that permitted smoking inside the home compared with non-smoking households but only for benzene (2.4 versus 1.1 μg/m3), toluene (11.0 versus 6.2 μg/m3) and ethylbenzene (1.4 versus 0.95 μg/m3). Cycle 4 of the CHMS was conducted from January 2014 to December 2015. Data files containing information on household- and respondent-level results for indoor air are now available. Data presented here represent household level data. Significant differences presented here refer to statistically significant differences between categories unless otherwise stated (p < 0.05). Concentrations are presented as a geometric mean, which is a type of average that is less influenced by extreme values than the traditional arithmetic mean. The geometric mean provides a better estimate of central tendency for highly skewed data.